We like the JSON Viewer tool for seeing JSON data in a more user-friendly way: http://jsonviewer.codeplex.com/ . Alternatively, if you don’t want to install a tool just go to the following online JSON viewer: http://jsonviewer.stack.hu/ . We have to say, the UI for the SPC 2012 web site and interface for downloading all sessions is, how to put this nicely? Well, it’s probably never designed for human beings. Luckily, if you’ve been to SPC2012 and want to get all the sessions, there is a solution that’s targeted towards non-human beings: http://nubo-corp.com/patrick-lamber/2012/11/spc-2012download-all-ppt-in-a-bach/ . As it turns out, PowerShell digs the UI more than we do (but we do feel sorry for the person creating the script containing all session names!). As you may be used from our blog, we devote some attention to the books we were technical reviewers of. Before we start with the review of Arduino in Action ( http://www.amazon.com/Arduino-Action-Martin-Evans/dp/1617290246/ref=sr_1_1?ie=UTF8&qid=1352294824&sr=8-1&keywords=arduino+in+action ), one quick word. People ask us why there are no books about esoteric topic X or topic Y. The answer is simple: the market is simply too small to justify the time and effort it takes to write about such topics. This was our biggest fear for this book: is the Arduino audience big enough to provide some type of ROI for the authors? We hope so. Arduino is an inexpensive, easy-to-use, open source hardware and software platform that allows you to control all types of cool sensors, LEDs and what not. This book describes that don’t even come close to our daily software activities, but it did make us feel like a bunch of inventors. Especially the chapter about wearables is a gem, we can imagine a future world filled with them! http://technet.microsoft.com/en-us/library/ee662513.aspx , provides an overview of the administrative and service accounts you need for a SharePoint 2013 installation. http://technet.microsoft.com/en-us/library/cc678863.aspx , describes SharePoint 2013 administrative and service account permissions for SQL Server, the File System, File Shares, and Registry entries. SharePoint 2013 Apps can’t communicate with each other (hey, did we just address a new feature for Apps vNext, the App communication framework? We bet your hat it is). But since SharePoint 2013 can interact with parent SharePoint sites, it might be a good idea to create lists and libraries in one of the parent SharePoint sites if you want multiple Apps to access them or need to establish basic interaction between multiple Apps. What’s the ideal dev machine now that SharePoint 2013 no longer supports being installed on a client OS? Probably run a Windows Server 2012 virtual machine using Hyper-V on Windows 8, with at least 24 GB. Do we trust the little App vendor? Although it’s still really early in the life of the SharePoint Store, it will be interesting to see how and if a potential issue will be resolved. The enterprise market is a totally different one than, let’s say, the smart phone market. Although it’s certainly possible that a one-man developer shop creates a valuable SharePoint App, and, through the SharePoint Store has no trouble reaching a huge audience, it remains to be seen if companies are willing to put enough trust in unknown smaller vendors to buy and/or use their Apps within their own SharePoint environments. We did notice that most of the Apps that are currently available ask for Full permissions, almost by convenience. We’re afraid that this will become the trend. It will definitely help smaller vendors trying to sell their Apps if they limit themselves in their needs for permissions. 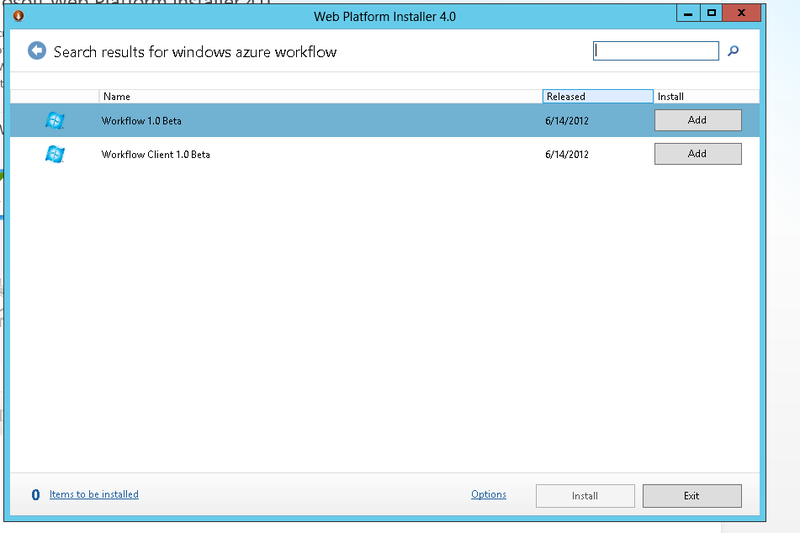 On SPC 2012, we saw a presenter use the Microsoft Web Platform Installer (Web PI) tool to get the latest version of Windows Azure Workflow (WAW), a required component if you want to run SharePoint 2013 workflows (btw, those workflows are not available for SharePoint Foundation), so we checked it out at http://www.microsoft.com/web/downloads/platform.aspx. Apparently, the tool is appalicious or apptastic or something, and makes getting the latest version of a wide range of components really easy. It will look for the v1.0 version of the Workflow client assembly, instead of v2.0. For now, it’s better to download WAW by searching for it and not do it via Web PI.